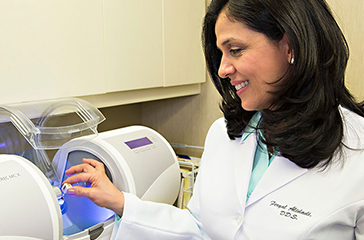 Dr. Alidadi utilizes advanced technology in her practice to ensure the best results for her patients. Dr. Feryal Alidadi uses the latest, most minimally invasive procedures to give you a healthy, beautiful smile. You’ll soon discover she’s a very gentle dentist who’ll do whatever it takes to make sure your treatment is comfortable. You will also find that she cares about you as a person. Dr. Alidadi is a people-person and will take the time to get to know you and listen to what you have to say. This way, she can create an individualized treatment plan that’s designed specifically for you and your budget. Dr. Alidadi is also quite conservative in her approach. She wants to keep your teeth and gums healthy and will do the procedures really necessary to save your smile. 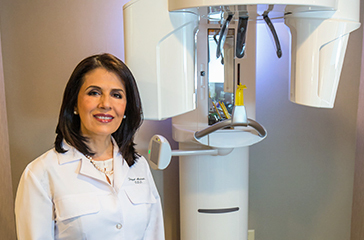 Dr. Alidadi has state-of-the-art tools and techniques that allow her to offer her patients outstanding dental care. This means dentistry that is more comfortable and less painful, with better results than dentistry of the past. Browse this page and learn about the different modern dental technologies Dr. Alidadi uses. With our CEREC (CERamic REConstruction) in-office CAD/CAM dental milling system, Dr. Alidadi can create and place durable and beautiful porcelain crowns, onlays and inlays (partial coverage crowns) in a single visit. To create your crown, Dr. Alidadi first takes a digital 3D impression of your teeth and loads the information into the CEREC computerized dental design unit. She immediately custom-designs your crown in special 3D software and has your new restoration fabricated in the CEREC computerized milling unit while you wait. With CEREC, there is no need for goopy impressions, temporary restorations or second visits. CEREC restorations are milled out of a single block of high-quality porcelain that has the same characteristics as healthy dental enamel. Since your crown is milled from a single block, it is also less prone to cracks and flaws than crowns made by other procedures. For precision planning of dental implant treatment, Dr. Alidadi takes a cone beam 3D CT scan. The scanner takes a rapid series of X-rays in a 360-degree circle around the head. These are then computer-processed into crisp 3D 360-degree views of your teeth, jaws, sinuses and surrounding anatomical structures. The 3D composite image can be viewed from any angle and magnified, providing detail not available from any other form of X-ray. 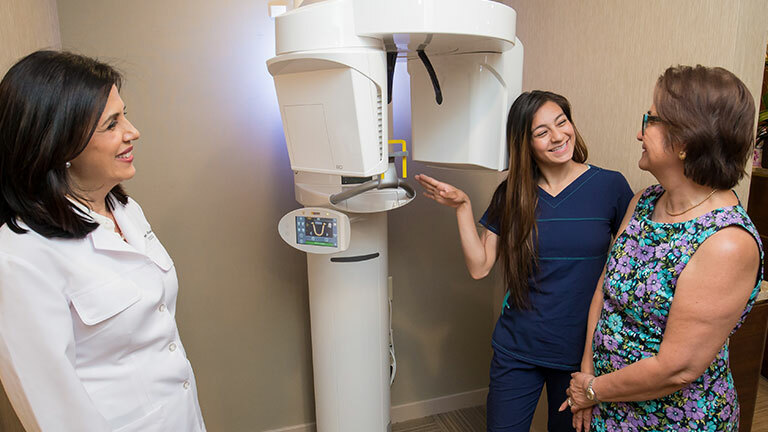 This advanced technology allows Dr. Alidadi to accurately diagnose your dental situation and plan your treatment accurately and without invasive procedures. The Millenium Laser is used for treating gum disease using the LANAP prodecure. LANAP Therapy accomplishes better and longer lasting results than traditional gum disease surgery and is gentler, quicker and much less invasive. The Biolase WaterLase laser is used in a number of dental procedures, such as cavity preparation and root canals. This makes the procedures faster and more comfortable. In many cases, the laser can be used instead of a dental drill, making anesthetic injections unnecessary. Dr. Alidadi uses the Biolase® ezLase soft tissue laser in many procedures, such as periodontal treatment, cold sore treatment, gum recontouring and “gummy smile” treatment. Through its pen-sized handpiece, the laser emits a concentrated light that precisely targets the area to be treated. The patient will experience faster healing times and less post-operative pain. CAESY’s interactive programming and 3D animation help make any dental topic easier to understand and remember. Complex procedures are explained in easy-to-understand language. These high-speed X-rays use 80% less radiation than ordinary ones, yet produce a nearly instantaneous image with the ability to use color contrast in that image. A curing light is used for polymerization of light cured resin-based composites. It can be used on many different dental materials that are curable by light, such as fillings and sealants. This very small digital camera is located on the tip of a wand and transmits real-time images to a computer monitor. It enables Dr. Alidadi to show you your teeth and gums in detail, which are enlarged on a monitor as either a still image or a video. This is a modern method of performing root canal treatments using an electric handpiece, rather than manual files, which expedites endodontic therapy. Ultrasonic scaling is usually more efficient and comfortable then hand scaling. Ultrasonic scalers vibrate at a frequency that breaks down bacteria and removes calculus, tarter and plaque without harming your teeth. 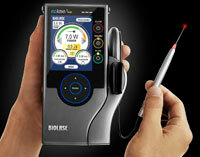 DIAGNOdent is a pen-like probe that sends a safe, painless laser beam into the tooth and checks its health. A number scale and an alarm will signal when there are signs of hidden decay. This allows us to determine if decay is lurking beneath the apparently healthy tooth surface. Dr. Alidadi uses an electric handpiece (drill) to remove tooth decay, sculpt tooth surfaces and prepare teeth for dental restorations. Electric handpieces are quieter than drills powered by other sources. The speed and strength of the drill can also be precisely controlled and adjusted to each patient’s needs, making tooth preparation more comfortable and more efficient.